In this program we wander the Plaza Mayor, ogle the lavish Royal Palace, rub shoulders with aficionados at a bull bar, ponder perplexing art at the Prado Museum, stare down a flamenco dancer, take in the cost of Spain's civil war at the Valley of the Fallen, look deep into Picasso's greatest work — Guernica — at the Centro Reina Sofía, and munch on pigs' ears in a "tapa tango." Carlos, a Spaniard who led tours for my groups for more than a decade, and his wife from Seattle, Jennifer, run Letango Tours, offering itineraries within Madrid and beyond, as well as customized tours (whether city, regional, or country-wide) and bookings anywhere in Spain. This is Europe's third-greatest palace, after Versailles and Vienna's Schönbrunn. It has arguably the most sumptuous original interior, packed with tourists and royal antiques. Today's palace is ridiculously super-sized — with 2,800 rooms, tons of luxurious tapestries, a king's ransom of chandeliers, frescoes by Tiepolo, priceless porcelain, and bronze decor covered in gold leaf. While these days the royal family lives in a mansion a few miles away, this place still functions as the ceremonial palace (call ahead to make sure it's not closed for a royal function), used for formal state receptions, royal weddings, and tourists' daydreams. Here, the specialty is sautéed pigs' ears (oreja, €5). While pig ears are a Madrid dish (fun to try, hard to swallow), this place is Galician — they serve pimientos de Padrón (sautéed miniature green peppers) and the distinctive ribeiro (ree-BAY-roh) wine, served Galician-style, in characteristic little ceramic bowls to disguise its lack of clarity (Calle de la Cruz 12, tel. 647-293-693). Run by Toni, this memorable little place has a helpful English menu and several fun, classic dishes to try: patatas bravas (fried potatoes in a spicy sauce), berenjena (deep-fried slices of eggplant), champiñones (sautéed mushrooms), and gazpacho that is generally served only during the hot season, but available here year-round just for tourists like you (closed July). This is where seafood lovers savor sizzling plates of tasty little gambas (shrimp) and langostinos (prawns), with bread to sop up the delightful juices. As drinks are cheap and dishes are small and pricey, you might just want to share a ración or sample some wine. Try gambas a la plancha (grilled shrimp) or gambas al ajillo (ah-HEE-yoh, shrimp cooked in oil and garlic) and a glass of sweet red house wine. They serve gazpacho May through September. Madrid has a few easy and affordable options: Intimate Casa Patas ("House of Feet") attracts big-name flamenco artists, with contemporary flamenco that may be jazzier than your notion — it depends on who's performing (reservations smart). Las Carboneras is more downscale — an easygoing, folksy little place a few steps from Plaza Mayor with a nightly hour-long flamenco show (reservations recommended). Las Tablas Flamenco offers a less expensive nightly show respecting the traditional art of flamenco, held in a modern, nondescript office block just over the freeway from Plaza de España. With sleek marble, red carpet runners along the halls, happy Muzak charm, and an attentive staff, Hotel Europa is a tremendous value. It rents 100 squeaky-clean rooms, many with balconies overlooking the pedestrian zone or an inner courtyard. The hotel has an honest ethos and offers a straight price. Six miles from El Escorial, high in the Guadarrama Mountains, a 500-foot-tall granite cross marks an immense and powerful underground monument to the victims of Spain's 20th-century nightmare — its civil war (1936–1939). Home to Picasso's Guernica, the Reina Sofía is one of Europe's most enjoyable modern art museums. Its exceptional collection of 20th-century art is housed in what was Madrid's first public hospital. The focus is on 20th-century Spanish artists — Picasso, Dalí, Miró, Gris, and Tàpies — but you'll also find plenty of works by Kandinsky, Braque, and many other giants of modern art. Once the private domain of royalty, this majestic park has been a favorite of Madrid's commoners since Charles III decided to share it with his subjects in the late 18th century. Siesta in this 300-acre green-and-breezy escape from the city. At midday on Saturday and Sunday, the area around the lake becomes a street carnival, with jugglers, puppeteers, and lots of local color. These peaceful gardens offer great picnicking and people-watching (closes at dusk). With more than 3,000 canvases, including entire rooms of masterpieces by superstar painters, the Prado is my vote for the greatest collection anywhere of paintings by the European masters. The Prado is the best place to enjoy the great Spanish painter Francisco de Goya, and it's also the home of Diego Velázquez's Las Meninas, considered by many to be the world's finest painting, period. In addition to Spanish works, you'll find paintings by Italian and Flemish masters, including Hieronymus Bosch's fantastical Garden of Earthly Delights altarpiece. Hi. 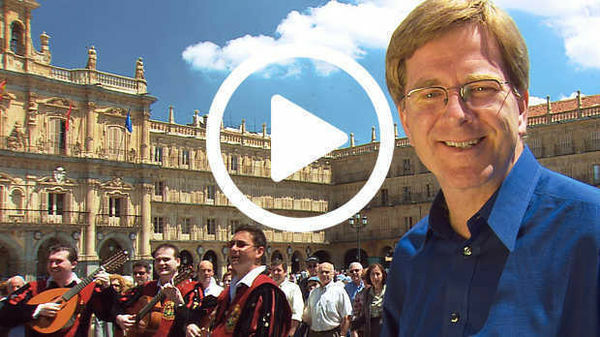 I'm Rick Steves, back with more of the Best of Europe. This time we're in Madrid — palaces, paseo…and perhaps Europe's finest ham: jamón. Thanks for joining us. Madrid was once the capital of the mightiest Empire on earth. It's studded with riches from those glory days. We'll experience the majesty of its palaces and museums — and, we'll enjoy today's Madrid at its fun-loving best. We'll marvel at lavish palaces, ponder the Prado's evocative art, belly up to a bull bar, day-trip to Spain's imposing civil war memorial, stare down a flamenco dancer, delve deep into Picasso's greatest masterpiece…and munch on pigs' ears during a tapas crawl. In the southwest of Europe, Spain dominates the Iberian Peninsula. Its capital, Madrid, sits high in the center. Madrid's core is bounded by the Royal Palace on the west and the magnificent Prado Museum in the east. The Plaza Mayor and Puerto del Sol mark the center. From here we side-trip to El Escorial and the Valley of the Fallen. Madrid is the hub of Spain. This vibrant capital — Europe's highest, at 2,000 feet — has a population of over four million. Most of the city is modern urban sprawl surrounding an intact, easy-to-navigate historic center. We'll limit our visit to this old core. Madrid is livable and fun to visit. Former parking lots are once again grand and people-friendly squares. Short posts keep cars off the sidewalks. And the fine old buildings show off their original elegance. The historic center is enjoyably covered on foot. No major sight is more than a 20-minute walk or a five-minute cab ride from Madrid's lively main square the Puerto del Sol. It's a hub for the Metro, buses, city celebrations, and a busy pedestrian shopping zone. And in the old center, it seems there's a surprise around every corner. My Spanish friend and fellow tour guide Carlos Galvin is joining us to share a local's insight into Madrid's culture and food. Carlos is taking me to a place famous for a food Spaniards are crazy about. If Spain had a national food it would probably be jamón — that's ham. The eatery, called the Museum of Ham, is tastefully decorated…unless you're a vegetarian, or a pig. This cheap and cheery stand-up bar is an assembly line of meaty treats. Rick: So in Spain you don't just say ‘ham'? Carlos: No, we have different kinds. We've got all those different kinds there. Like for example, jamón granadino, or bellota extra, or Salamanca. You know, the different origins. Rick: So, what do we have here? Carlos: So, here we have regular jamón serrano and we have ibérico. This one, the pig has been killed after three months and has been eating just basic pig-food. This one has been eating acorns. Carlos: Yeah, they have freedom in the fields and they're eating acorns. Rick: And this one is much more expensive? Carlos: Yes, this cost $3, this would cost like $12. Rick: Can you taste the difference? Carlos: I can, yes. Oh yes. Here, try. Rick: Acorns, happy pigs running free in the mountains. Plaza Mayor is a stately, traffic-free chunk of 17th-century Spain. Whether hanging out with old friends, enjoying a cup of coffee, or finding a treasure at the Sunday coin market, it's an inviting place for people to gather. The square is filled with emblems of Spain's powerful past. Bronze reliefs under the lampposts show how upon this stage, much of Spanish history was played out. The square hosted bullfights. It was the scene of generations of Carnavale gaiety. And during the Inquisition, many suspected heretics were tried here and punished…in this case, publicly strangled. Thankfully, the brutality of the Inquisition is long gone. But one brutal spectacle that survives today — anchored deep in the psyche of Spain — is the bullfight. Whether you actually go to a bullfight or not is entirely up to you. But anyone, for a quick sense of the action, can pop into one of Madrid's many bull bars. Aficionados gather at a bar like this after fights — or to watch one on TV. This bar is a temple to bullfighting. Rick: If you like bull fighting, how do you justify it, with the animal? How do you excuse it? Carlos: It's an art. Bull fighting is an art. It's not about the cruelty, it's just an art, and it's a whole aesthetic. You're fighting against an animal that is 500 or 600 kilos and there is this guy right in front of him with this cape and sword. And he is brave enough, and he's wearing this suit and people are so supportive of him they want to see him like doing well. Rick: So some bullfighters are actually very popular, like heroes or popular heroes? Carlos: Oh absolutely. Rick, look at these photographs. I think they prove that the matador does not always win. Carlos: Hemingway was at that bullfight. Hemingway was there. Rick: Hemingway? Hemingway saw Liston… Cordobés kill …? Rick: So Franco and Hemingway saw the "Babe Ruth of bullfighting" — El Cordobés — kill Liston. A few blocks away stands one of Europe's most stunning palaces. Madrid's Royal Palace was built by Phillip V in the 1700s. He was born in Versailles, and while he ruled Spain for 40 years, he stayed very French. With acres of lavish paintings and tapestries, a king's ransom of chandeliers, priceless treasures, and bronze decor covered in gold leaf. There are over 150 fancy clocks in the palace — all in working order. Portraits of past royal residents — these are by the great Spanish painter Goya — decorate the walls. In the lavish throne room, golden lions tread red velvet, symbolizing the might of the monarchy — whose coat of arms incorporated many realms and whose empire spanned both hemispheres. Above the throne, the ceiling fresco by Tiepolo celebrates that vast Spanish empire — upon which the sun never set. A rainbow leads to a macho red-caped conquistador and American Indians — just some more distant Spanish subjects. Phillip V, the grandson of France's King Louis XIV, began the Bourbon dynasty, which continued into the 21st century with the popular King Juan Carlos. The palace is still used for formal state ceremonies and receptions. The King throws dinner parties for up to 150 guests at this bowling lane–sized table. The king's front yard? It's enjoyed by all the people of Madrid. And this plaza is another example of how throughout Europe, energetic governments are turning formerly car-congested wastelands into charming public spaces. Madrid's mayor is nicknamed "the mole" for all the digging he's done. Where's all the traffic? Under your feet. And so is the subway. Madrid's subway is simple, speedy, and cheap. Ticket ten-packs save money and can be shared by several travelers. The city's broad streets can be hot and exhausting. A subway trip of even a stop or two saves time and energy. To transfer, check a map and simply follow the signs. Green Salida signs point to the exit. For dinner in Madrid…it's a movable feast. For maximum fun, people, and atmosphere, do the "tapa tango." It's a time-honored tradition of going from one bar to the next, munching, drinking, and socializing. When it comes to variety, Madrid is Spain's tapas capital. Grab a toothpick and stab something strange. While Spaniards don't eat dinner until 9 or 10 o'clock, with a meal like this, I can eat early and still go local. For starters we're going for one of Madrid's quirkiest snacks and this spot [La Oreja de Jaime] is named for it, la oreja de oro — sautéed pigs' ears. Pigs' ears are a favorite here…and Jaime is a frantic one-man show who somehow gets everything just right. Carlos: This wine is like the house- made wine from the northwest of Spain, from Galicia. Carlos: Yes, it's a little bit cloudy, so you don't see the poor quality. Carlos: This is pig's ear. This is the cartilage actually. This is sautéed with a little bit of olive oil, Spanish paprika, and parsley. Rick: And that's actually the cartilage? Rick: Hmm, crunchy. Wow, pigs' ears. I never thought I'd be eating actual pigs' ears. Just up the street, Casa Toni is run by…Toni. He's popular for his refreshing gazpacho — the cold tomato-and-garlic soup. Rick: Carlos, gazpacho is really refreshing in the summer, right? Carlos: Yes, gazpacho is like a vegetable soup with a tomato base. Carlos: But it's very refreshing. Yeah, it's cold. At Toni's you can have huevos con chirizo, patatas brava, mystery meats, and the house vermouth. Don't worry about paying until you're ready to go. Then ask for la cuenta (the bill). Next, it's La Casa del Abuelo — packed with seafood lovers savoring sizzling plates of tasty shrimp and prawns. I like gambas al ajillo shrimp sautéed with garlic and gambas a la plancha (grilled shrimp). A glass of the house red wine — right out of the keg — is incredibly cheap. The litter on the floor is normal; that's where people traditionally toss their trash and shells. For a sweet late-night finale, enjoy pudding-like hot chocolate and churros. Churros are the favorite local donut. Dunk and chat…recalling highlights of the day…and looking forward to tomorrow. We're side tripping — a short drive into the hills from Madrid — to San Lorenzo de El Escorial. The town has charm…but everybody visits for this: its sprawling palace. In the mid-1500s, King Phillip II needed a suitably grand palace to establish his family dynasty — the Spanish branch of the Habsburgs. He also needed a headquarters from which to run a strong centralized Spanish state. Phillip ruled his huge empire — which stretched from Mexico to Manila — from here. El Escorial was built during the Reformation, a time when Catholic Spain was defending the Church against Protestant "heretics." The enigmatic, introverted, and extremely Catholic King Philip II directed the Counter Reformation from this spot. 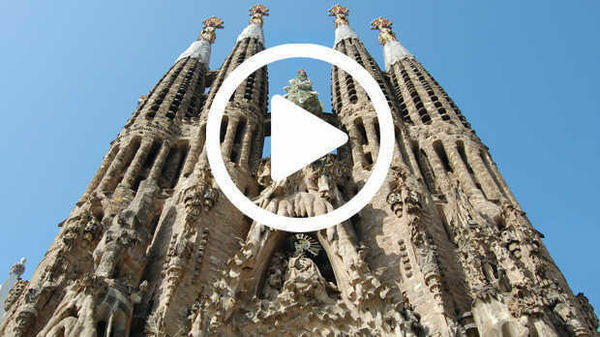 Today, it's packed with history and art — offering an evocative trip back to Spain's most fascinating age. El Escorial was more than an impressive palace for a divine monarch. It was a grand mausoleum for Spain's royal family, it was a monastery to provide constant prayer for the king's soul, and it was a religious school designed to teach and embrace humanism in a way that fit the Catholic faith. King Phillip built in austerity: plain white walls and bare-bones chandeliers. His simple bed — with a mattress that's not even queen-sized — came with a view…of the high altar in the basilica just next door. The basilica — the architectural and spiritual heart of the complex — is dedicated to the martyr St. Laurence. The altar features a painting of the flame-engulfed grill with St. Laurence meeting his fiery death. Downstairs, the Royal Pantheon is the gilded resting place of four centuries of Spanish kings and queens. There is a strict filing system: The first and greatest, Charles V and his queen, flank the altar on the top shelf. Their son, Philip II, rests below Charles and opposite his wife…and so on. Because kings might have married more than once, to make it here, a woman needed to be both queen and mother of a king. The immense Library shows that knowledge was a priority for the Spanish royalty. The ceiling celebrates the seven classical disciplines with a burst of color. The elaborate model — constructed after the age of Copernicus — insists on proving that the solar system revolves unmistakably around the earth. As you leave, a plaque above the door warns you'll be excommunicated if you take a book without checking it out. Who needs late fees when you hold the keys to eternal damnation? The emotional intensity of Spanish culture can be experienced in its royal palaces. But it's most riveting in the music and dance of its people. It's time for flamenco. While Seville is the home of flamenco, Madrid draws Spain's top artists. The singing and dancing gives you an exotic whiff of the Arabic and Gypsy influences on Spanish culture. Some shows are sultry and serious. Others are light and designed mostly for tour groups. And some bars are more contemporary catering to young locals who come out for their favorite acts. I prefer a hotel right in the town center — like Hotel Europa. This place is popular among travelers with my guidebooks for its warm and helpful welcome. Upstairs there's a red-carpet charm with plush halls, a velvety lounge, and basic rooms with views overlooking Madrid's shopping street action. Its convenient cafeteria is just right for breakfast or a relaxing coffee break. For another thought-provoking excursion, we're side-tripping from Madrid up into the Guadarrama Mountains. A 500 foot-tall granite cross marks the Valley of the Fallen — an immense and powerful underground monument to the victims of Spain's devastating Civil War. In the late 1930s, a million Spaniards died as conservative Catholics and the military slugged it out against secular democrats. Unlike America's Civil War, which pitted north against south, this war was between classes and ideologies. It divided every village. The right-wing Fascists ultimately won and Franco ruled Spain, as its dictator, until 1975. The sorrowful pietà draped over the entrance must have had a powerful impact on mothers who came here to remember their fallen sons. A solemn silence fills the basilica. As if measuring sorrow in distance, this 870-foot-long chamber is far longer than any church in Europe. The line of torch-like lamps adds to the somber ambience. Franco's prisoners, the enemies of the right, were put to work digging this memorial out of solid rock. Franco's grave takes center stage. Some Spaniards come here to honor him…others come to be sure he's still dead. But interred here — in chapels flanking the altar — are the remains of tens of thousands — victims from both sides — who lost their lives in Spain's civil war. With every visit, I stare into the eyes of those angels with swords, and think about all the "heroes" who keep dying "for God and country," at the request of the latter. Another place to remember the victims of Spain's Civil War is back in Madrid at the Centro Reina Sofia. This modern-art museum has a fine collection of paintings, but we're heading directly to the epic work showing the harsh realities of modern war. In 1937, Guernica, a village in northern Spain, was the target of the world's first aerial saturation-bombing. It was a kind of dress rehearsal for the horrors of World War II — approved by Franco, carried out by Hitler. The Spanish artist Pablo Picasso heard the shocking news and immediately set to work sketching the destruction as he imagined it. In a matter of weeks he wove these bomb-shattered shards into a large mural called Guernica. For the first time, the world could see the destructive force of the rising fascist movement — a prelude to World War II. It's as if shards from the bombing are pasted onto the canvas. A woman looks to the sky, horses scream, a soldier falls — body shattered, sword broken. A wounded woman flees a burning house. A bull — symbol of Spain — ponders it all, watching over a mother and her dead baby — a modern pietà. Picasso's painting threw a stark light on the brutality of Hitler and Franco. Guernica caused an immediate sensation, and with each passing year…and war, it seems more prophetic. Picasso put a human face on collateral damage. Today, Spain enjoys its peace and prosperity. That's particularly clear at the Retiro Park. It's made to order for a green and breezy escape from the city. During weekends it becomes a carnival of fun. Madrid's much-loved "Central Park" offers splendid picnicking, row boating, and people-watching. Opposite the park, the Prado Museum holds my favorite collection of paintings anywhere. The paintings give an eye-pleasing overview of Spain's rich history, from the Golden Age through its slow fade. In the 1500s, Spain was Europe's superpower, flush with gold from newly discovered America, and ruled by this man: Emperor Charles V. Here the great Venetian artist Titian portrays Charles as he was — the most powerful man in the world. Charles' son, Philip II, though very religious collected a bevy of sensual Venetian paintings. In Titian's Venus and the Organ Player, we see the conflicts these people struggled with — torn between high cultural pursuits — as symbolized here by music — and more worldly pleasures. Danae, also by Titian, is a virtual Renaissance "Miss August." Money falling from the sky made royals and aristocrats — the people who commissioned this kind of art — feel their wealth was blessed by God. Hieronymous Bosch — who painted 500 years ago and seems radical even today — gives all this hedonism a different spin. His Garden of Earthly Delights — a three-paneled altarpiece that actually hung in the king's bedroom — shows where all this worldly temptation ultimately leads. …and in the third panel, the bubble pops. These party animals are heading straight to hell…a burning, post-apocalyptic, wasteland where sinners are led off to eternal torment. Every sinner gets his just desserts. Gluttons are themselves consumed, good-time musicians are tortured by their own instruments, gamblers have their party forever crashed, and a lecher gets sexually harassed by a pig-faced nun. In the center of it all a face peers out of this bizarre nightmare — a self-portrait of the artist: Bosch. Starting in the 1600s, Spain entered a long slow period of decline. But its wealthy court continued to finance great art. Perhaps the most loved painting in all the Prado is Las Meninas, by Diego Velasquez. Velasquez takes us behind the scenes as he paints a portrait of the king and queen. The artist paints himself at work, along with a princess, who's watching her mom and dad pose. She's joined by her servants…the "meninas." In this wonderfully 3-D painting, the unique perspective is that of the king and queen as they pose. In fact, they can be seen in the mirror at the back of the room. By 1800, Spain was no longer a world power. But it continued to produce great artists. Francisco de Goya was Spain's official court painter. He dutifully portrayed the king and queen in all their royal finery. But many see Goya becoming disenchanted with his patrons. Here in these vacant faces he reveals the ineptitude of the royal family. Goya's painting called The Second of May recalls how Spain hoped the ideals of Revolutionary France would spread, bringing democracy to Spain. But when Napoleon invaded, their hopes were dashed. On May 2, 1808, Madrid's working people staged a protest. French soldiers, with their Egyptian mercenaries, slashed through the crowds and arrested the ringleaders. The next day — this painting's called The Third of May — the French began reprisals. Ignoring the rebels' passionate pleas, a faceless firing squad mows them down — without mercy. Goya, disillusioned by all the senseless violence, portrayed common people as the victims of war. Thankfully, stepping out of the Prado, it's a bright and happy day in Madrid — which seems determined to celebrate its freedom and enjoy life to its fullest. While Spain remembers its rich and poignant history — and shares it well with visitors — the focus of today seems to be on living well. After every trip to this exciting city, the impression I take home is that of a thriving people with an enduring culture…which really knows how to dance. Madrid — permeated with passion — from its grand history to its love of life today. Let's explore more of Europe together again soon. Until then, I'm Rick Steves. Keep on travelin'. Hasta luego.